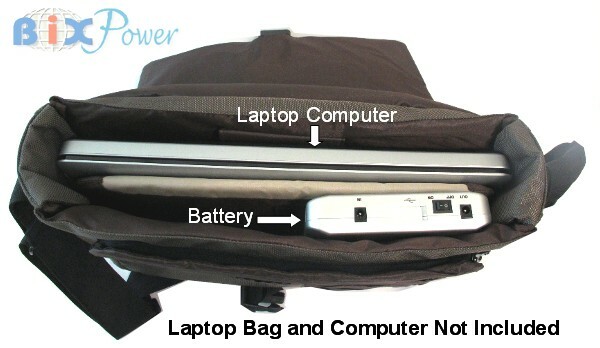 This super high capacity (223 Watt-hour, or 60300mAh) external universal rechargeable battery pack may add extra 9 ~ 15 hours running time for most laptop/notebook computers, 20 ~ 40 hours for most ultrabooks/tablets. It can charge iPad internal battery 7 ~8 times or add 80 hours extra running time for iPad. 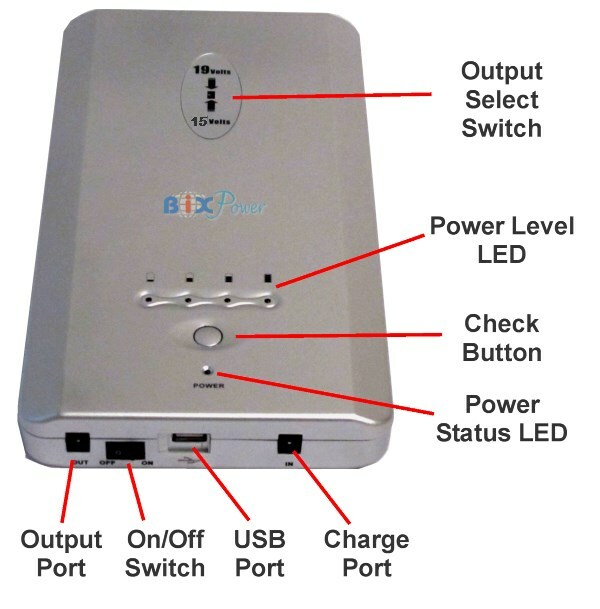 It has 15V or 19V selectable output voltage plus 5V USB port, together with 18 or more connector tips, it works for many different laptop notebook computers and other devices. Made with high quality Panasonic Li-ion battery cells. Its universal platform works for most of notebook computers on the marketplace. Max. Output Current:* This battery actual output current depends the demands from powered device and is variable. It can by any number under rated Maximum current. Note: There are many different ways to rate a battery capacity on market. 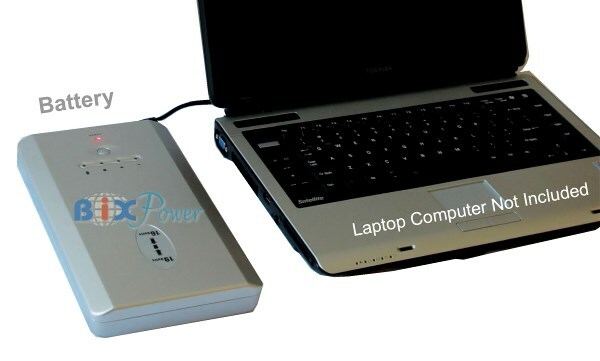 For your information, a typical 6-cell internal notebook battery capacity is about 49 Watt-hour, a typical 12-cell internal notebook battery capacity is about 98 Watt-hour. 223 Watt-Hour Capacity is equivalent to 60300mAh if rated as most external batteries on market. Battery Capacity Rating: Watt-Hour, or Wh, is a more accurate unit to show the power capacity than Amp-. Hour (Ah) that was used before. The Watt-Hour unit means the wattage that the battery can provide within one hour. 220 Watt-hour (Wh) capacity means the battery can theoretically last 223 hours if the device it powered only needs 1 Watt power, or 10 hour if the device need 22 W power. 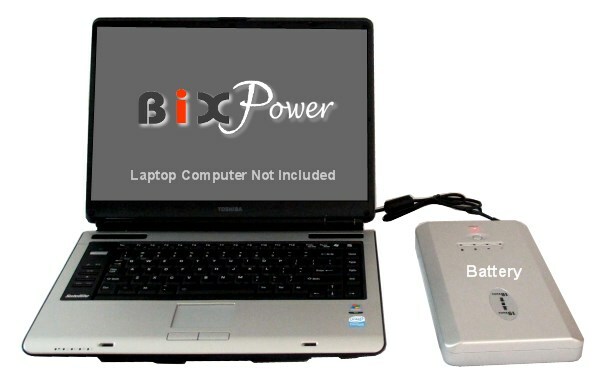 A typical 6-cell internal notebook battery capacity is about 49 Watt-hour. A typical 12-cell internal notebook battery capacity is about 98 Watt-hour. You can use the 5V USB Port on the battery to charge cellular phone, MP3 player or other small electronics that can be charged from a 5V USB port. However, the battery pack does not come with any cable for connector tips for this USB port. Our optional Z4 cable and connector tips will work with this 5V USB port. 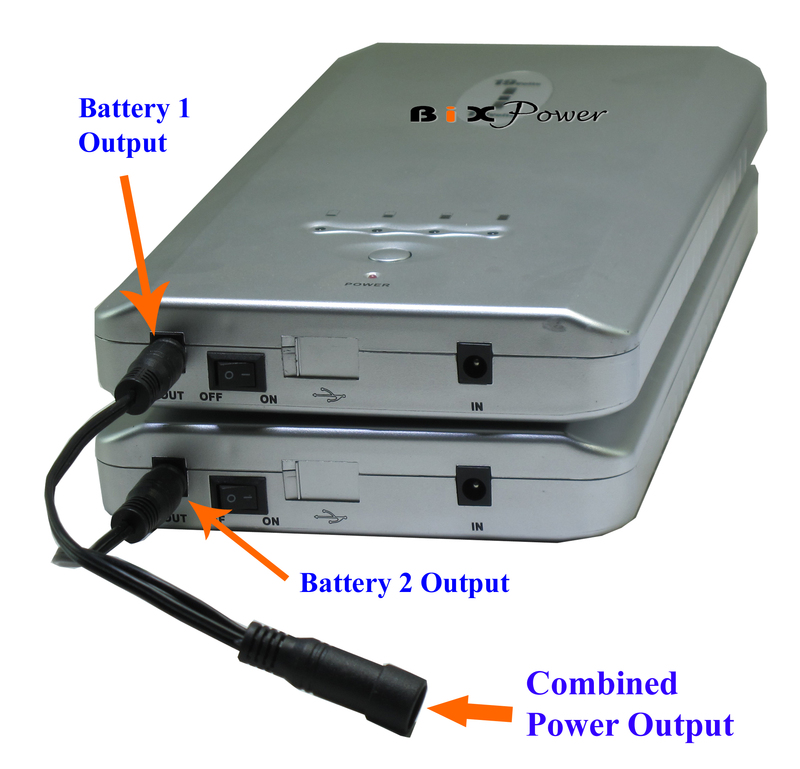 Other usage Can provide 15V and 19V DC power for other electronic devices also. can only be used for designed laptop/notebook computers. This battery has its own AC battery charger and 12V car charger. You can charge it from any 110V or 220V AC power source or from a car 12V cigarette lighter socket with the 12V car charger. Both the AC charger and the 12V car charger need to connect to the In port of the battery pack. 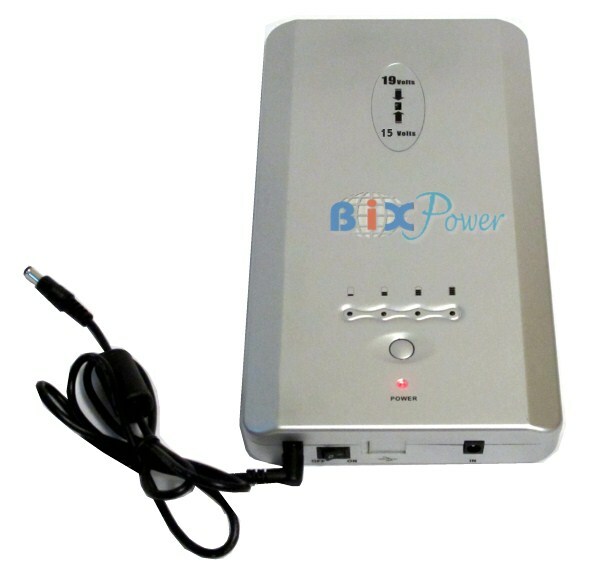 BP220 battery has specially designed to be able to charge and discharge at same time. However, since each lithium battery has limited charge/discharge cycles ( around 500 times), it is not recommend to use the battery when AC power is available. The package comes with 12 or more connector tips for different laptop/tablet/notebook computers. This external battery capacity is about 220/49=4.5 times of your internal battery capacity. If your internal notebook battery can run 2 ~ 3 hours, then the external battery pack can theoretically run about : 9 ~ 14 hours. Acer: Most models use connector tips: #7, #31. Some models may the battery power output cable directly without any connector tip. Most models need to set battery output voltage at 19V. Asus: Most Asus laptop computers can use the battery power output cable directly without any connector tip. Some new may use connector tips #26, #31. Most models need to set battery output voltage at 19V. Asus models that comes with 12V power adapters will not be compatible with this battery. 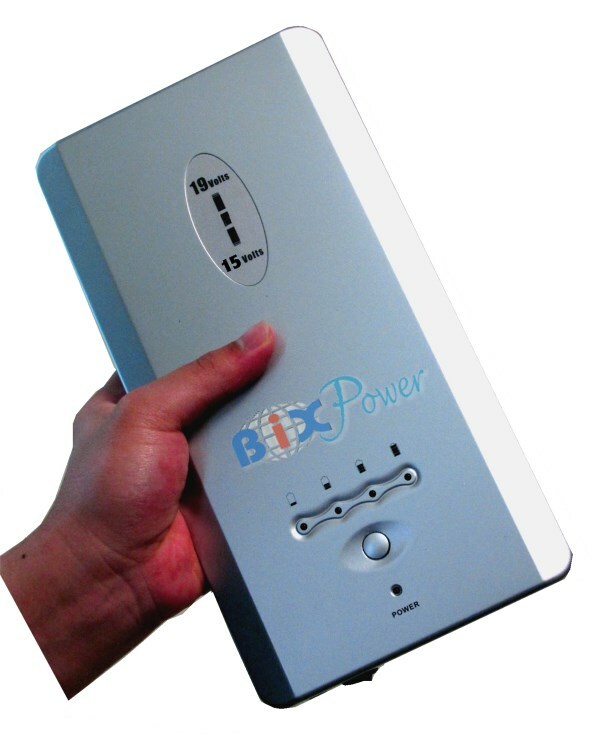 For models need 12V power, you may select BiXPower BP160 battery. Compaq: Most models use connector tips: #1, #24, #33, #34, #35. Some models may the battery power output cable directly without any connector tip. Most models need to set battery output voltage at 19V. Dell: Most models use connector tips: #27, #32. Some models may the battery power output cable directly without any connector tip. Most models need to set battery output voltage at 19V. Fujitsu: Most models use connector tip: #6. Some models may the battery power output cable directly without any connector tip. Most models need to set battery output voltage at 15V or 16V. Gateway: Most models use connector tips: #3, #7, #31. Some models may the battery power output cable directly without any connector tips. Most models need to set battery output voltage at 19V. HP: Most models use connector tips: #1, #24, #33, #34, #35. Some models may the battery power output cable directly without any connector tips. Most models need to set battery output voltage at 19V. IBM: Most models use connector tips: #15. Some models may the battery power output cable directly without any connector tip. Most models need to set battery output voltage at 19V. 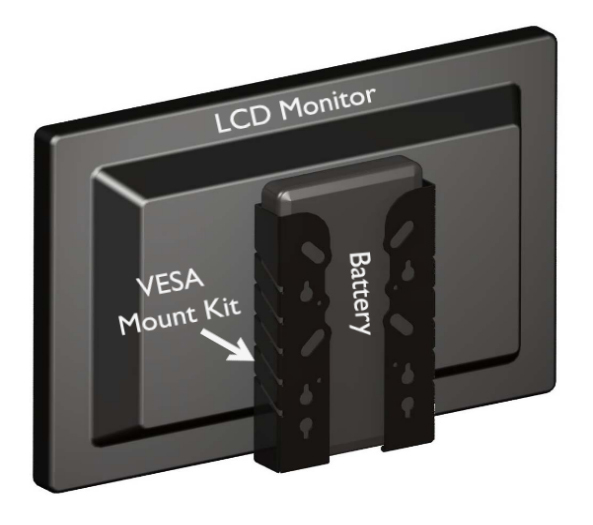 Some new Lenovo computers may need rectangle shape connector C36, which may not included with the battery pack but can be purchased separately from BiXPower. Lenovo: Most models use connector tip: #15. Some models may the battery power output cable directly without any connector tip. Some new Lenovo computers may need #36 connector tips, which may not included in the standard package and may need to purchase separately. Most models need to set battery output voltage at 19V. Panasonic: Most models use connector tip: #6. Some models may the battery power output cable directly without any connector tip. Most models need to set battery output voltage at 15V. Some may need to set at 19V. Samsung: Most models use connector tip: #2. Some models may the battery power output cable directly without any connector tip. Most models need to set battery output voltage at 19V. Sony: Most models use connector tip: #6. Some models may the battery power output cable directly without any connector tips. Most models need to set battery output voltage at 19V. Some may need to set at 15V. Toshiba: Most old models come with 15V power adapter will use connector tips #5 and #13. Most new models come with 19V power adapter may use the battery power output cable directly without any connector tip. Models come with 15V power adapters need to set battery output voltage at 15V. 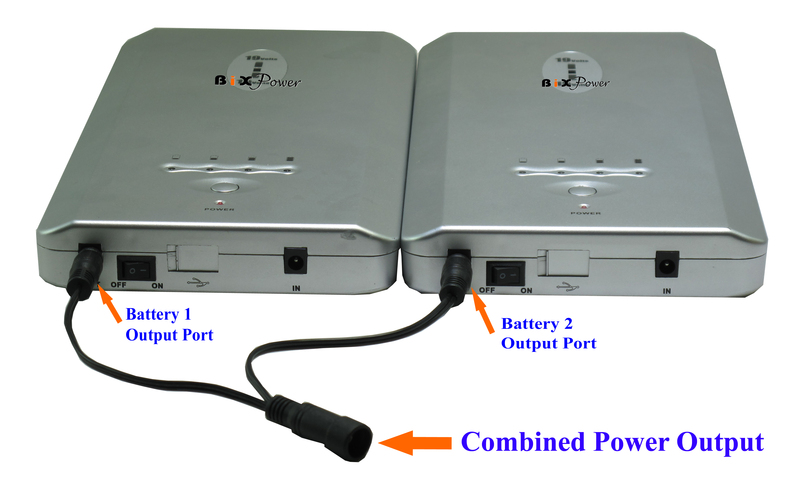 Models come with 19V/19.5V/20V power adapters need to set battery output voltage at 19V. 1. 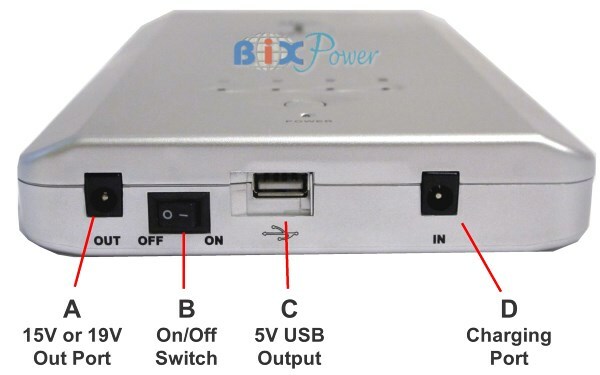 Your computer original power adapter output voltage is between 15V ~ 20V. 2. The power adapter connector is a regular round shape barrel connector, not a special shape. Most US domestic airlines allow passengers bring two (2) larger lithium ion batteries ( capacity from 100 Watt-hour to 300 Watt-hour) in their carry-on. However, some international airlines may only allow 2 lithium ion batteries with maximum 160 Watt-hour capacity. Please check with your airline company to see whether this 223 Watt-hour battery is allowed to carry on if you plan to bring this battery with you. If this battery is not allowed, you may consider our BP150 and BP160 batteries, which with capacity less than 160 Watt-hour. Protected from short circuit means that a battery terminals are protected from being touched by metal. When metal such as keys, coins, or other batteries come in contact with both terminals of a battery, it can create a circuit or path for electricity to flow through. This can cause extreme heat and sparks and even start a fire. To prevent short circuits, keep spare batteries in their original packaging, a battery case, or separate pouch or pocket. ARE BP220 BATTERY PACKS PROTECTED FROM SHORT CIRCUIT? YES. BP220 Battery Packs are built within a protective solid shell. Built in circuitry protection also protects against thermal run-away and overheating. Warranty info: One year limited warranty covers manufacturing and quality defects only. Please note that rechargeable battery is a wear out product. As the rechargeable battery has been used for a while, the user will notice a decline in the running time of the battery. After use a few months, when press power level check button, the 4th or even the 3rd power lever LED may not light up anymore. This is normal and does not mean the battery is defective. The life of a rechargeable battery operating under normal conditions is generally around 500 charge-discharge cycles.